We rarely think about where F. Scott Fitzgerald's hard-living, often tragic generation of American writers went to school. This year, however, Fitzgerald's own almost-alma mater merits a note: the novelist began his studies at Princeton exactly one hundred years ago this fall, beginning classes on his birthday, September 24, 1913. To mark the occasion, that Ivy League institution has digitized their The Great Gatsby-writing alumnus' manuscripts. Earlier this year, in fact, they completed the process on Fitzgerald's manuscript, or manuscripts, of Gatsby itself. 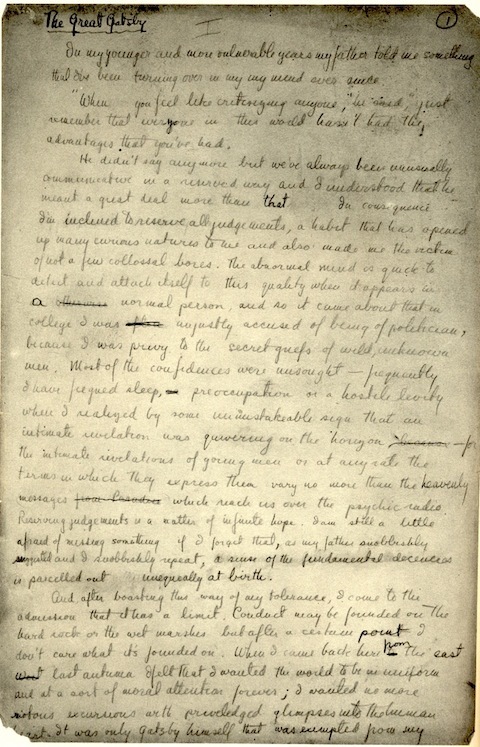 "We can see Fitzgerald at work on his third novel over a four-year period," says the announcement from Princeton University Library's Department of Rare Books and Special Collections (RBSC), which offers "Ur-Gatsby (2-page fragment), the author’s abandoned effort, conceived in 1922 and written in 1923; The Great Gatsby autograph manuscript (302 pages), which he largely wrote in France and completed by September 1924;" and "corrected galleys of 'Trimalchio,' the novel’s working title when it was typeset by Charles Scribner’s Sons in 1924, only to be much reworked by the author early in 1925." You can find these online in the Princeton University Digital Library. There you can also, naturally, find papers associated with This Side of Paradise, the novel Fitzgerald began, under the working title The Romantic Egoist, while still at Princeton. The book, says the RBSC, "still stands as the most famous literary work about Princeton University. While Fitzgerald was not a good student and never graduated, dropping out in 1917 to join the U.S. Army during World War I, he began learning the craft of writing as an undergraduate and befriended other students who were aspiring authors, Edmund Wilson, Class of 1916, and John Peale Bishop, Class of 1917. Fitzgerald came to form a deep affection for Princeton that lasted until his untimely death in Hollywood." They've digitized the corrected 1918 typescript of The Romantic Egoist, and the manuscript of This Side of Paradise. You can peruse all of these online in the PUDL's Fitzgerald collection. Some regard Gatsby as a perfect novel; Edmund Wilson called Paradise "one of the most illiterate books of any merit every published." ("Hastily written" and "somewhat disjointed," says the RBSC itself.) But seeing how either became the Fitzgerald books we know today will prove instructive to readers and writers, academics and (like Fitzgerald, evidently) non-academics alike. You can find Gatsby and This Side of Paradise in our collection of 500 Free eBooks.